What kind of eye primer do you use and why? Sam – I generally just use a regular primer all over my face, right now I’m alternating between the Laura Mercier Radiance Primer and the E.L.F. Poreless Primer. If I’m going out or doing an extra dramatic eye look I’ll pop on the Urban Decay Eyeshadow Primer Potion, which is amazing and helps the eyeshadows stay in place all night long. Sarah – My favourite is the Collection Primed & Ready Illuminating & Reviving Eye Primer, which I totally bought on a whim! It was on offer at the time – probably my main reason for using it and I just love it. It’s creamy but not thick and it doesn’t take ages to dry. What colour eye shadow makes you feel bold and pretty at the same time? Sarah – Gold. Anything gold. I feel that shimmer makes me feel immediately better. Sam – Purple, any bold, dark shades of purple. Purples are my nudes. 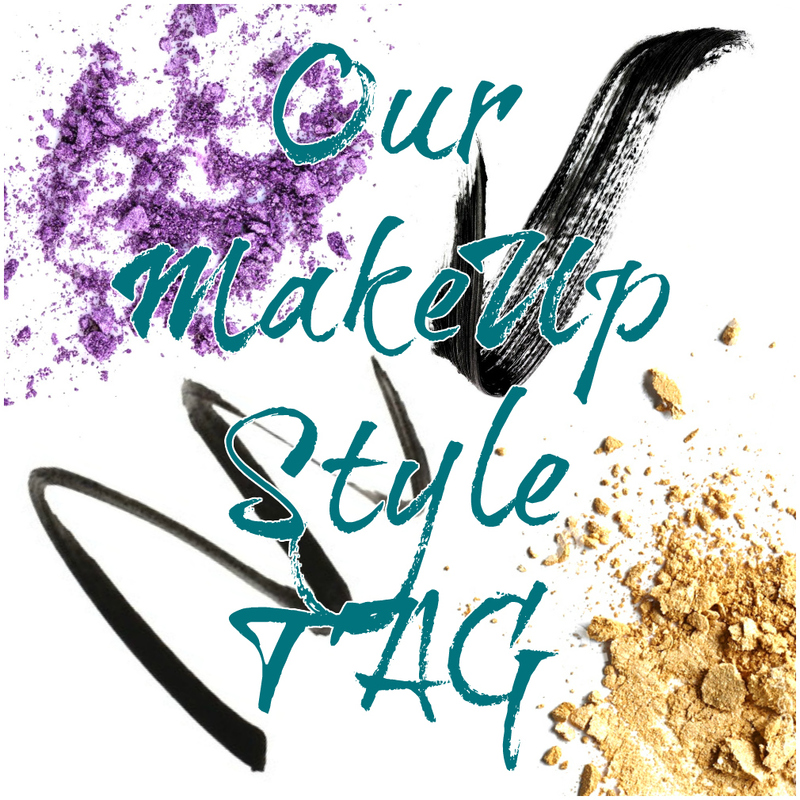 What eye shadow colour do you least like to wear and why? Sam – Browns, nudes, natural warm tones, I’ve just never been a fan. I like all the colours of the rainbow! Sarah – Yellow or orange. They just don’t suit me. Do you wear liquid or pencil eye liner? Black or brown liner? Sarah – Both, but recently I’ve been using eyeshadow more as a liner because it’s easier to smudge. Mostly black. Sam – Pencil eyeliner, in black. My hands aren’t steady enough for liquid liners, I’d end up looking like a Jackson Pollock. My favourite black eyeliner, that I always go back to, is the Primark £1 stuff, you get two in a pack with a pencil sharpener, LOVE IT! It lasts all day and smudges beautifully. I’ve thrown our a MAC eyeliner in favour of that Primark one. My all time favourite mascara is the Urban Decay Perversion Mascara, it’s a large, regular, old fashioned brush, you can build the crap out of it and it just never gets clumpy, give you wicked long lashes too. I don’t like gimmicky wands, I like a no muss no fuss mascara. Sarah – Maybelline of the two. At the moment I’m loving the Eyeko Black Magic Mascara and the Olivia Hale Mascara which are on two very ends of the price spectrum. If you could have your brows permanently done or not wear any blush for the rest of your life which would you choose? Sarah – Brows! Bronzer could replace blush and I always have to do my brows, ya know to feel more like I’ve got a handle on life. Sam – Have my brows permanently done. I don’t wear blush, it scares me and my cheeks are rosy enough. Does your best friend or you wear more makeup? Sam – Well it depends on which bestie we’re talking about, if it’s Sarah, I’d say we wear about the same amount as we use a lot of the same products. If I was talking about my childhood best friend, it would definitely be me, she’s so bad with makeup, she doesn’t need it but when she attempts to wear it I always end up fixing her, it can be pretty funny sometimes. Sarah – Sam and I are pretty the same with wearing makeup. Twinnies ha ha! But another good friend of mine wears more than I do but it’s only being asked the question that I’ve really thought about it. Who taught you how to do makeup? Sarah – Well… me to be honest, but I do remember having read a Bobbi Brown makeup book years ago and I probably got a lot of tips from there. I feel that when I was 14 years old I first discovered eyeliner and from then on I was always being told off for it at school. Not sorry. Good lesson in eyeliner application. Sam – I guess I taught myself, I didn’t have anyone to teach me growing up. I’m an artist and very creative which helped and I think experimenting with products and colours helped too. I mean you can watch tutorials and stuff, have someone teach you, but in the end I think you just do what makes you feel good about yourself. Are you a fan of cream products? (Blush, bronzer, contour, etc?) Why or why not? Sam – Oh for sure, I’m all about the dewy, glowy look. I love liquid bronzers and highlighters. Apart from ten million eyeshadows I don’t own a lot of powder type products, I just don’t like a matte finish. My favourite liquid product is the Rouge Bunny Rouge Bronzing Glow Liquid, it gives my pale skin this warm, natural glow, with a subtle shimmer. I’m obsessed with it, it’s blends so well and can be layered up for a darker tone. Sarah – No. I’ve tried cream blushes and bronzers and I just feel like they sit on my skin too much. Also I do have oily skin at times so I then feel I have to over powder them and that’s wasting the colour. I’m not a great fan of contour products… I sort of feel it’s overhyped… I know that’s not a blogger allowed comment. I have though LOVED using cream highlighters, they totally work for me. Are you a project panner? What projects are you in right now? Sarah – I’m not really. I am trying to finish my Soap & Glory One Heck Of A Blot Mattifying Powder, I’ve touched pan on it but only at about a 20p size hole. My eye primer I mentioned earlier I’ve just noticed, has about a quarter left, must re-purchase. I’m also trying to use up my little travel size Benefit Hoola Bronzer. Sam – Seeing as I only just discovered what project panning was, I’m gonna say no. I buy a lot of makeup, especially highlighters and eyeshadow palettes and am in no rush to use them up. Setting spray: Do you believe in it? Which is your holy grail? Sam – I do, but I can manage without it. I’ve only ever bought and used the Urban Decay All Nighter Setting Spray, I use it mainly if I have an event to go too, but it’s not really a must have. Sarah – I’ve only really tried two setting sprays and neither really did anything for me. But I don’t tend to use products that won’t last the day. I feel it’s of no benefit for me and it’s just something else to wait for it to set. Ha ha! If you’ve done this tag leave a link to it in the comment below, we’re fierce nosy.